"..."Fiddler on the Roof" is among the greatest Broadway musicals for any number of reasons: a score without a single dud; rich, sturdy, funny characters who somehow reward with each revisit; a high-stakes story that not only blends the personal and religious but morphs before your eyes into a meditation on change. But it also has one very clever device that many shows have tried to copy but few have emulated: Tevye, the philosophic dairyman, gets to talk intimately to God. And God, as such great stars as Topol and Zero Mostel quickly figured out, can be conveniently located (from Tevye's perspective) right in the theater balcony. Tevye, really, gets to talk to us. What's not to love?" "...just in case you needed additional proof that the Paramount Theatre in Aurora is now continually one-upping Broadway - with productions featuring exceptional performances, a grand-scale orchestra and lavish design - this "Fiddler" easily serves as the latest proof. With propulsive direction by Jim Corti (Paramount's artistic director), thrilling choreography by Gordon Peirce Schmidt (inspired by Jerome Robbins, but with many added flourishes), and lush musical direction by Michael Keefe that fills the beautifully restored 2,800-seat theater, the show moves far beyond "golden age of Broadway" nostalgia. Fresh, funny and stormily emotional, it is a must-see for a whole new generation." "...What impressed me most about this production were all the little things. Sure, they nailed the big Broadway numbers like Sunrise, Sunset and If I Were A Rich Man. But the play also captures many smaller, more nuanced qualities of life such as the genuine affection felt (but not always shown) between parent and child (as well as husband and wife and between neighbors). I am not sure I would want to live in Anatevka, but it was a pleasure visiting the other day. I also think that if Paramount keeps this up, maybe someday a Broadway musical will sell itself as "Better than Aurora."" "...Essential to a successful Fiddler is the acting of Tevye, a milkman and the father of five daughters. Imagine the audience reaction when it learns that on opening night the leading role needs the understudy, David Girolmo, for at least a week. His first monologue immediately says that we are in good hands, and if there is any doubt, his first solo song, "If I Were A Rich Man" wins everyone over. His subtle style and a lazy rolling motion causes audible chuckles from most listeners. What a performance! Girolmo uses a soft gentle manner to deliver the humorous zingers perfectly, and then comes on with explosive power and emotion when the role demands. 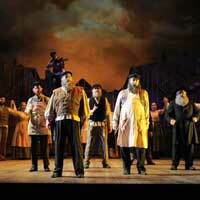 It is hard to imagine a Tevye any better...different perhaps, but hardly better." "...Tradition! That is what "Fiddler on the Roof" is all about! Over the years, many of us have seen production after production- large theaters, small ones, in the round, arena and even on the grass. I myself have had the good fortune of doing the show as actor and director and the privilege of portraying the "everyman" character of Tevye. This being said, no matter how many times we have seen it ( or done it) on the stage, or even the movie version, this is one of the favorites in Musical Theater History. Based on the short stories of Sholem Aleichem, with a wonderful, warm and heartwarming story by Joseph Stein and music by Jerry Bock with lyrics by Sheldon Harnick, "Fiddler" tells us the story of a small community in Tsarist Russia during the early 1900′s. Tevye, the milkman has many crosses to bear during these hard times- keeping his family together and continuing to maintain all the traditions of his Jewish Heritage; it's not easy! This role is to be played by Peter Kevoian for the run, but we got a wonderful interpretation of this beloved character by David Girolmo, who is in actuality playing the character of Lazar Wolf, the Butcher, but has been handling this role as the understudy) David's marvelous portrayal of this beloved milkman proves the point that seeing an understudy perform is not the end of the world. All who witnessed his performance got more than their money's worth." "...The cast includes some of Chicago's finest vocalists and dancers and features the excellent Jazmin Gorsline and Brooke Singer as daughters Hodel and and Chava. Their delightful "Matchmaker" number with Kelley Abell reveals their collective, if humorously depicted, fear of an arranged marriage. Young Kiev, tutor and revolutionary, Perchik, is beautifully played by rising Chicago star Jim DeSelm. Expert vocalist Brandon Moorhead does well as Fyedka, the young Russian soldier in love with Chava, and provides one of the shows high points in the joyous barroom anthem, "To Life.""